The Centenary Tree Canopy Walkway is a new curved steel and timber bridge that winds and dips its way through and over the trees of the Arboretum. Inspired by a snake skeleton, and informally called ‘The Boomslang‘ (meaning tree snake), it is a low-maintenance, low-impact sculptural raised walkway. The Walkway takes the visitor from the forest floor into and through the trees and bursts out above the canopy, giving spectacular panoramic vistas of the surrounding mountains, Garden and Cape Flats. This walkway is 130 m long, narrow and slender, with a few wider view-point areas, and lightly snakes its way through the canopy, in a discreet, almost invisible way. The walkway is crescent-shaped and takes advantage of the sloping ground; it touches the forest floor in two places, and raises visitors to 12 m above ground. It is more than just a traditional boardwalk – like a snake, it winds and dips. 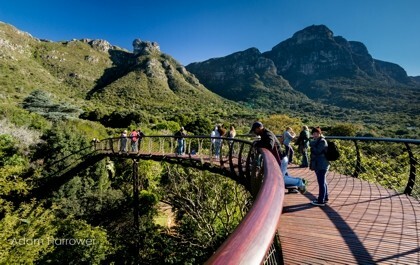 The Centenary Tree Canopy Walkway was built in 2013-14 to celebrate the centenary of Kirstenbosch in 2013, and opened to the public on 17 May 2014. 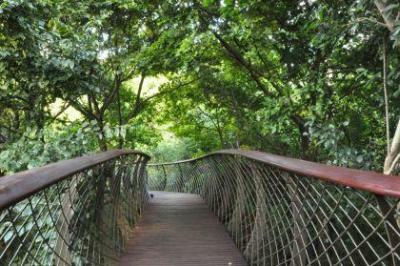 There is no additional fee to walk on the Boomslang, other than the normal Garden entry fee. 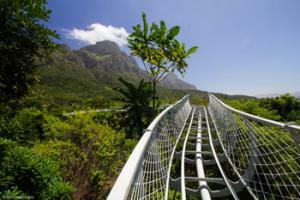 Visit the Kirstenbosch homepage to see the entry charges for the garden. The Boomslang is accessible to wheelchairs, but the Arboretum is situated on a slope and quite far into the Garden, and visitors in wheelchairs will need assistance to negotiate the steep gradients to get to and from the walkway and the mulch paths in the Arboretum. The best route for wheelchairs to follow to the walkway is from Rycroft Gate (Gate 3) – please see this route map for details and other options. There is a stop and drop bay at Rycroft Gate and parking across the road. Wheelchair users enter Rycroft Gate via the vehicle-access gate, which is controlled by the Ticket Office at Rycroft Gate. Wheelchair users are also advised to enter and exit the walkway via the eastern entry point (marked x on the route map) as this is the shortest distance over mulch paths to and from the walkway. The construction costs of around R5 m are met entirely from bequests from many benefactors – in particular, R1m from the late Mary Mullins. The planning of the walkway started in 2012. The foundations were laid down in June 2013. Construction of the steel structure started in August 2013 and on-site construction of the framework began in November 2013. It was completed on 16 May and opened to the public on 17 May 2014.
Who is the architect and who is the engineer? This project is a collaboration between Mark Thomas Architects and Engineers Henry Fagan & Partners consulting engineers. The main spine of the walkway is tubular steel, with welded ribs and a light mesh giving the cross bracing, allowing the whole form to act as a bridge-spanning beam. Continuous shaped timber handrails ensure the safety of the visitor. The decking is stained, treated, slatted pine, placed on edge and spaced to accommodate the walkway’s curves. The structure was pre-fabricated in 6 m lengths that were hoisted by crane and bolted together on site. This caused minimal disruption to the trees during assembly and reduced construction time in the Garden. The foundations are submerged, hand-dug, reinforced concrete pads in select positions, approximately 12 m apart. The excavations for the foundations were done under careful supervision and care was taken not to compromise any root structures. All that can be seen of the foundations are small concrete stub columns above ground, onto which the slender steel rod columns are bolted.